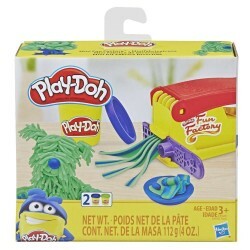 Create lots of silly, squiggly, wiggly creations with this little press 'n squeeze Play-Doh machine! The Play-Doh Mini Fun Factory toy is a tried and true classic, and this one comes in a convenient mini size for an easy and fun on the go activity that's even easier to store in small spaces. Just load one (or both) of the 2 non-toxic Play-Doh colors, choose 1 of 15 different shapes on the 3 rails, and press the lever to make silly strings of joy come out of the machine. Give toddlers and preschoolers a giggle break during their busy day or pack it in your bag to take along as a travel toy anywhere you've got a flat surface to play. • CLASSIC MINI PLAY-DOH FUN FACTORY TOY – The well-loved Play-Doh Fun Factory machine has inspired open-ended creativity for generations! This smaller-sized version is an easy kids' activity idea that's even easier to store or take on the go. • COMPLETE CREATIVE ACTIVITY IN A SMALL CONVENIENT SIZE – Take a little time for some big creative fun with the Fun Factory set including 3 shape-making rails, a kid-friendly plastic knife, and 2 non-toxic Play-Doh colors in 2-ounce cans. Just slide a rail onto the machine, choose a setting, and squeeze up to 15 different squiggly, wiggly Play-Doh shapes! • PERFECT FOR KIDS AGES 3 AND UP – Preschoolers and big kids alike can use their imaginations to create all kinds of colorful things with their Fun Factory machine. It won't take up much room in the toy box at home, and it's also a great distraction for parents to pack in a bag for an on the go activity.